Though most of our marketing efforts for clients are focused on and around their digital infrastructure, traditional marketing services are useful and effective – especially if they are focused as part of a strategic plan coupled with digital. Traditional marketing by its nature is one-way communication to a mass audience, so messaging is typically simplified. The traditional marketing tactics that are leveraged will point back to your digital framework, taking your prospective customers on a journey of engagement. A niche company was spending a lot of money to attend a huge trade show and their prospect list upon returning from the show was beginning to shrink. Because time was of the essence, creating a micro website focusing on that specific show was a great solution instead of overhauling the main website. On the microsite, an extensive piece of content was created, diving into 13 Red Flags relating to the industry. For the traditional marketing aspect, a print piece was distributed at the trade show that teased the entire list of 13, but just included the first two red flag solutions. “For the next 10, visit this URL,” it read, driving traffic to the company’s website to convert. Branding: Branding is so much more than your company’s logo, color scheme and fonts. It involves every aspect of your businesses – including your team – and consistency is the most important aspect. You would never want to confuse your existing customers or prospects by going “off brand.” Not to sound like a broken record by using this adage again, but your branding elements should all be singing in the same chorus. Not every member of the choir is singing in the same note, but they harmonize together like angels. Savoir Faire can ensure you hit the right notes consistently. Print: One of the things to avoid, if possible, is the old-school trifold brochure that goes into every element of your company. Attention spans are shortening. Flyers and brochures that are focused on something specific – whether a service, event or some other element of your business, are a great opportunity to be informative about your specialities. These can be extremely valuable if you have a physical location where customers frequent or if you have an upcoming event. For example, one of our clients offers a whole menu of services and products. But for their flyer, the focus is on their top two offerings – the backbone of the business. It’s important to think outside the box with print materials, too, in an effort to stand out from the pack. Do you have a list of addresses? Are you purchasing or renting a list of prospects based on zipcodes or demographics? Do you already have a printer? Have you researched shipping costs with the post office, based on size, weight and shape? We’ve been down this road many times – remember, most of the team came of age last century! – so we can help you avoid the pitfalls and save some money by connecting to the right prospects. Advertising: While we focus a lot of time is focused on digital advertising, there is new research that says traditional tactics – including print – still work. Millennials are reading newspapers and magazines and are likely to trust companies who are utilizing print ads. Depending on what you need to market, radio and TV ads could also be smart options. Traditional ad content that will work across multiple channels should complement your digital marketing as well. While you may already be implementing some traditional marketing tactics, you may not be doing it well. There are likely other marketing techniques that you could implement that would have a greater impact. Don’t stop everything you’re doing. When it comes to your marketing, it’s important to compare your current tactics with your business goals, improve what works, let some things go and present some new ideas. Having a healthy mix of traditional and digital marketing tactics is key and it’s time to begin discovering yours. Often, local businesses need to maintain a presence in their communities. This requires investing in and staying consistent with traditional marketing tactics that are working and beefing up your commitment to the neighborhoods around you. Remember to have consistency and sophistication in your output. Savoir Faire’s toolbox and vision will help you execute effectively in your market. The team at Savoir Faire was reared on radio. We cheered at the launch of MTV (on our tenth birthday). We know that video killed the radio star. We saw the simple brilliance in the Nike swoosh logo. We were in awe of Apple’s 1984 TV commercial. We were there. We saw the Golden Age of Advertising (commonly understood to run from 1950-2000). 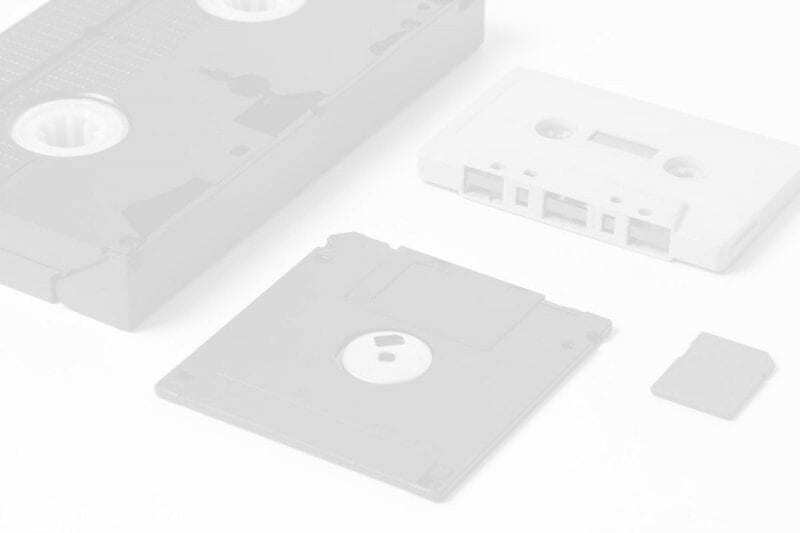 We knew life before digital. Hell, we knew life before cable! Most of us were gainfully employed in the pre-Internet era. We remember interoffice envelopes with their scratched out previous recipients. We have, however, continued our journey of communications and marketing into the digital age. While we’re fluent in the current age, our native tongue is traditional marketing. Think of us as a hybrid automobile — a mix of classic car parts and modern technology to guide you safely and confidently through the journey. We’ll pick you up at the crossroads of traditional and digital marketing and hit the road together. While we most often focus on building an effective digital infrastructure for our clients (website, social media, email, etc. ), we find that some companies still need traditional marketing tactics as a part of their overall marketing program. Whether that’s print materials, direct mail or traditional advertising, there are plenty of good reasons to utilize traditional tactics. 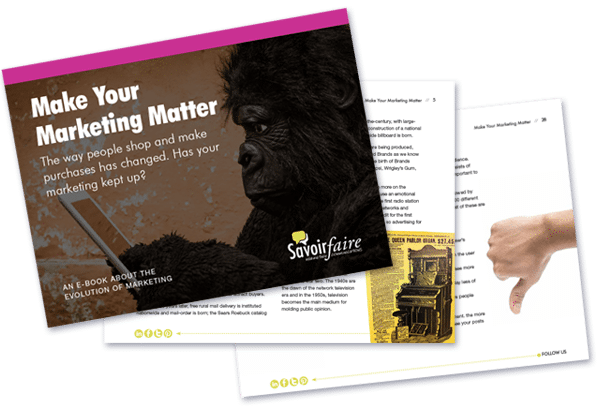 Savoir Faire can help you identify those reasons and the places where you should implement traditional marketing tactics. Even the digital giants use traditional tactics. We see TV ads for Google, Microsoft and Verizon products, billboard ads for T-Mobile and print ads for Samsung. Apple, a company at the forefront of design and innovation, still utilizes print ads to great effect. Has your digital marketing program kept up? Download our e-book to learn more.